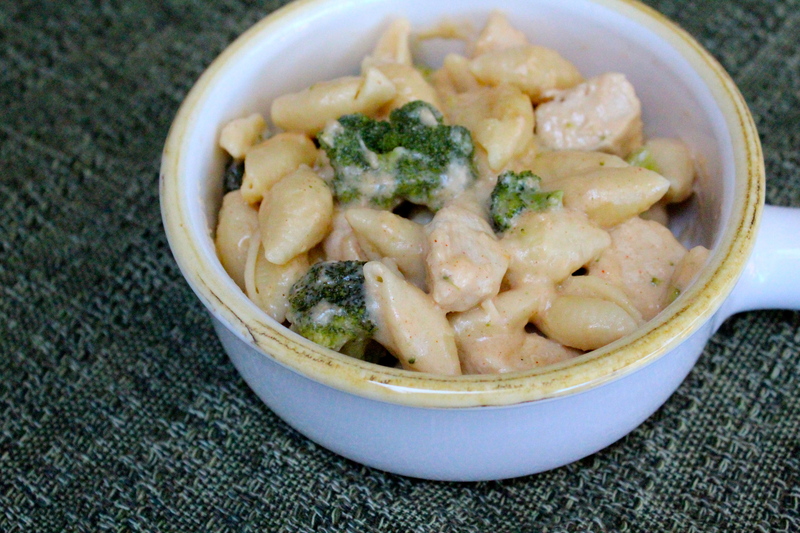 Happiness Project #41: Chicken & Broccoli Shells! Apparently, I’m on a roll with my Dinner Dishes. Partly in response to the attention of my newest kitchen helper (and by helper, I mean my unintentional food taster), Chloe Girl. No, not my Daughter (who is my official baking assistant) but rather my 3 year old Dog, who, in more ways than one, is my unofficial 2nd Toddler. Since no matter where I am, so is my Chloe Girl. Even if that means that I have two little girls snuggled up on my lap most of the day. Ever seen a 20lb Toddler and a 20lb Beagle/Terrier try to snuggle up on one person’s lap? It’s adorable but not always an easy feat. But that’s Family life, my friends! Something I would never change. Anyhow, here’s the story on the Dinner Dish, which I saw on Pinterest and altered slightly (more so for my benefit than anyone else’s). Since my husband REALLY likes chicken (you should see how many bags of chicken we have stored away in our freezer) and I like broccoli, I loved the idea of this very quick and simple skillet meal! Even with a pinch of chili powder, though my fondness for spices is usually rather lacking. Ready for a taste? Firstly, cook the pasta according to it’s package instructions. Add the broccoli florets to the pasta during the last 3 to 4 minutes of cooking. Drain and set aside. Once your chicken halves are fully thawed, heat the olive oil in a large skillet, over medium-high heat. Add the diced chicken squares to the skillet and cook for 8-10 minutes, until fully cooked through. In a mixing bowl, whisk together the milk, chicken broth, flour and pinch of chili powder, until well combined. Stir the milk mixture into the skillet with the chicken and cook for 4-5 minutes so that the sauce begins to thicken slightly. Add in the pasta mixture and then the two cheeses, stirring the cheese until melted and well combined with the pasta and chicken. Continue to cook for a few minutes, letting the sauce at the bottom of the skillet bubble slightly. Remove from the stove and let cool for a bit before serving. Simple! Yummy! And very filling! Three Cheers for Dinner! And Dogs, too! « Happiness Project #40: Cookie Batter Waffles!